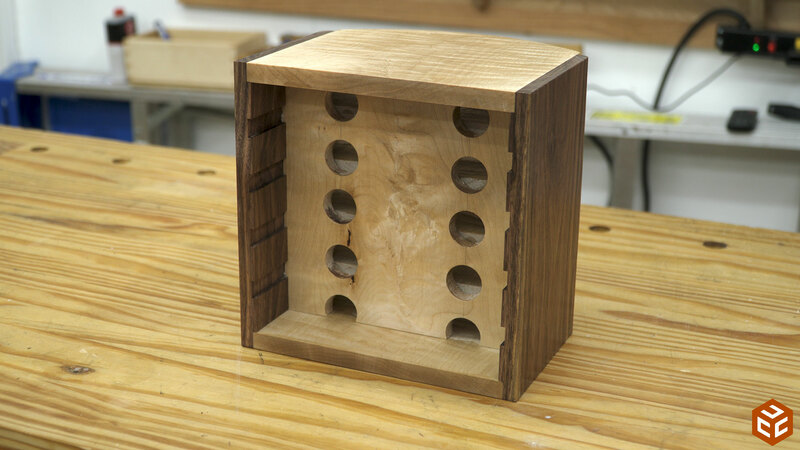 About 6 months ago my friend Jeremy asked if we could make a “catch all” box or a “pocket empty” box. Just something simple to put on his computer desk to empty his pockets at the end of the day. 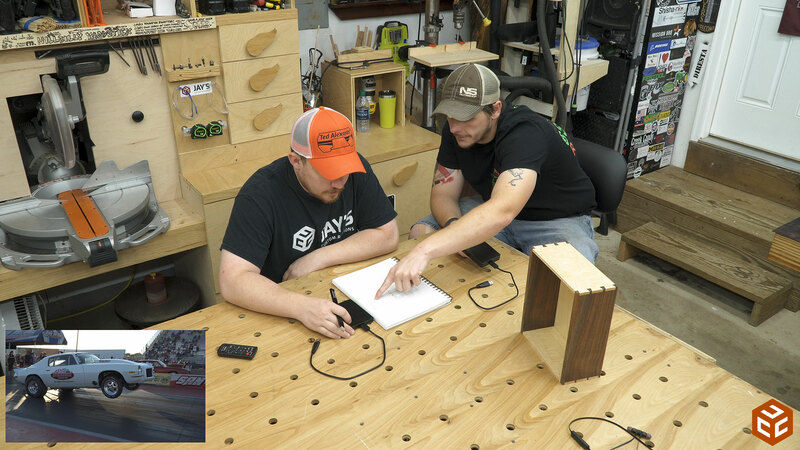 Because woodworking isn’t a hobby for him I wanted us to make something he would really be proud of and hopefully learn something along the way. 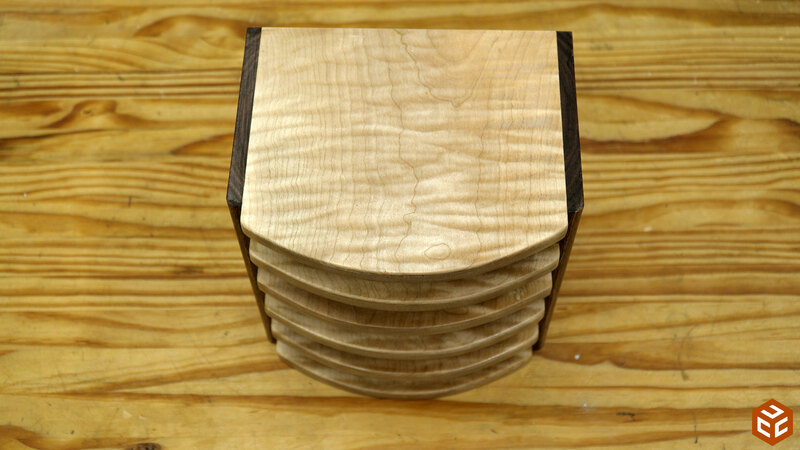 We used curly maple and walnut and cut dovetails for the joinery. 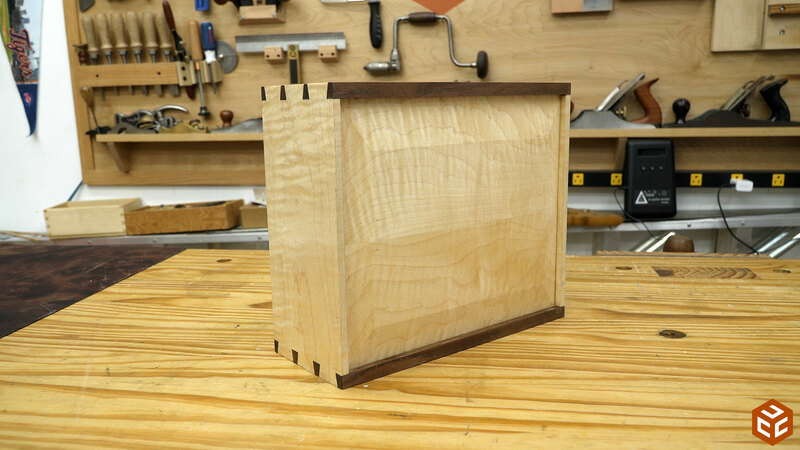 The bottom of the box is a solid raised panel made from matching curly maple and floating in a blind groove on all four sides. Fast forward 6 months and his media business is booming. He’s travels a lot to document drag racing and other automotive events in both photo and videoformat. Because he is always mobile and because photo and video take up a lot of digital space he uses a lot of external hard drives. So the goal for this project was to come up with a solution to organize his external hard drives while matching the box we already made. We started the design process with pencil and paper to brainstorm and get a concept down. Then headed to SketchUp to refine the concept. After tweaking things for a bit we settled on a design that had a curved front to allow easy access to the drives near the sides and an inset back panel to allow for cable management as needed. CLICK HERE to download the SketchUp file I used to create this project. 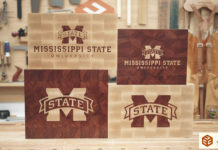 With the design in hand I picked out two boards that would match the previous project. A piece of curly maple that I’ve had for about a year now and a piece of walnut that would be just wide enough for the sides of this project. 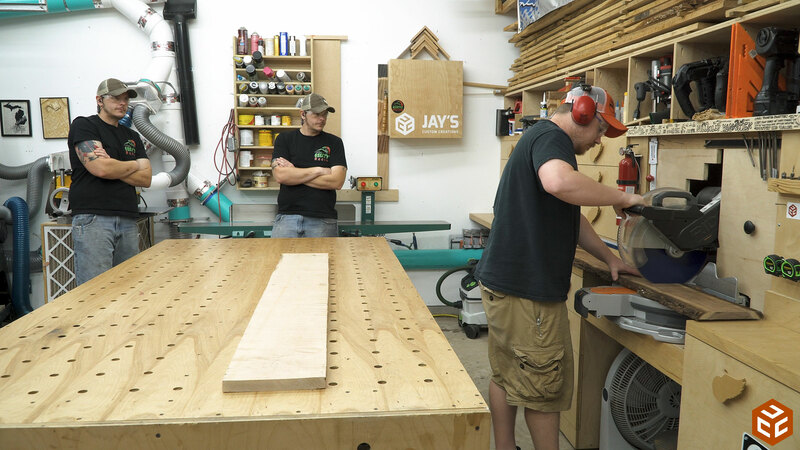 My milling process always starts at my miter saw station so I began with the walnut and Jeremy followed with the maple. 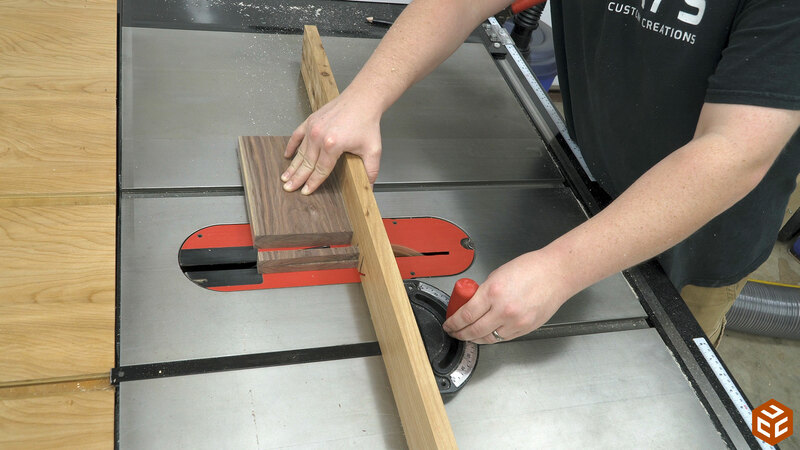 I say it a lot but having a dedicated cross cutting station that can handle long and wide boards with ease and is always setup and ready to go is incredibly handy. After the initial cross cut the pieces are jointed and planed to their final thickness. And then trimmed to final size at the table saw. 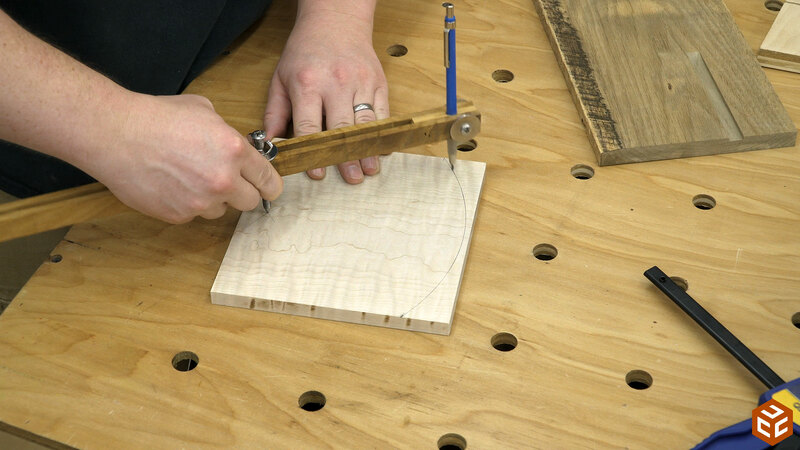 I prefer to crosscut smaller pieces at the table saw for improved accuracy and with the help of a crosscut sled or miter gauge I feel the process is safer as well. So once all of the parts were sized we did a quick mock-up, just holding the pieces in place, to get a glance at how it would look in the end because sometimes when you do this you notice something you want to change. 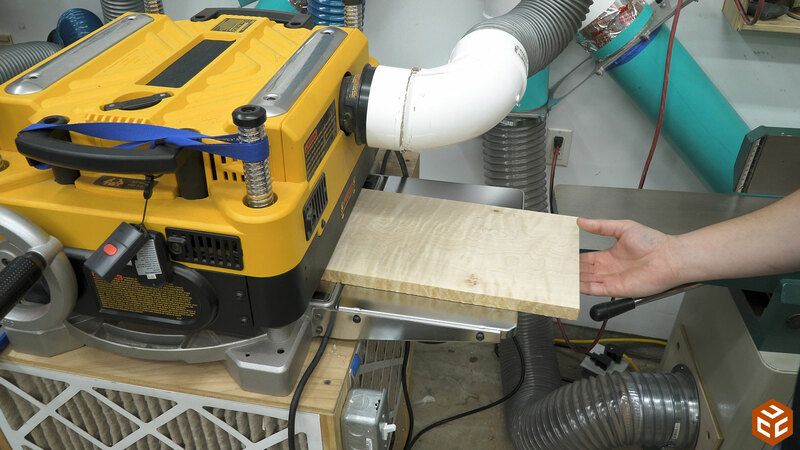 In this case everything looked OK so we setup the dado stack in the table saw and made a couple of test passes to dial in the width to match our material. 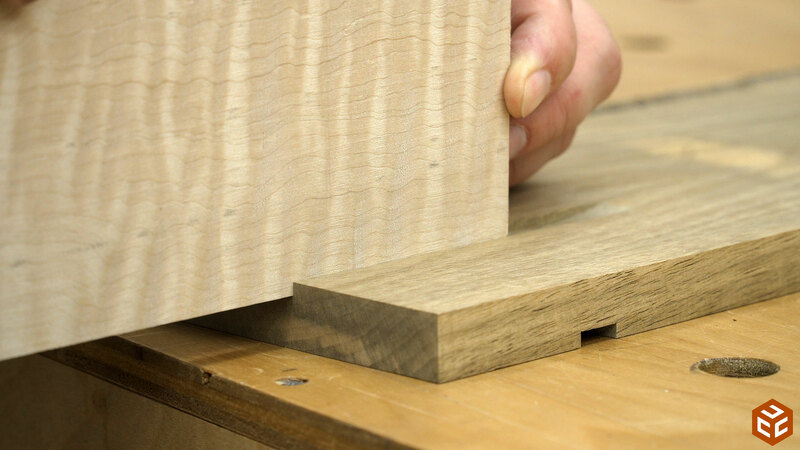 Then cut all the dados. 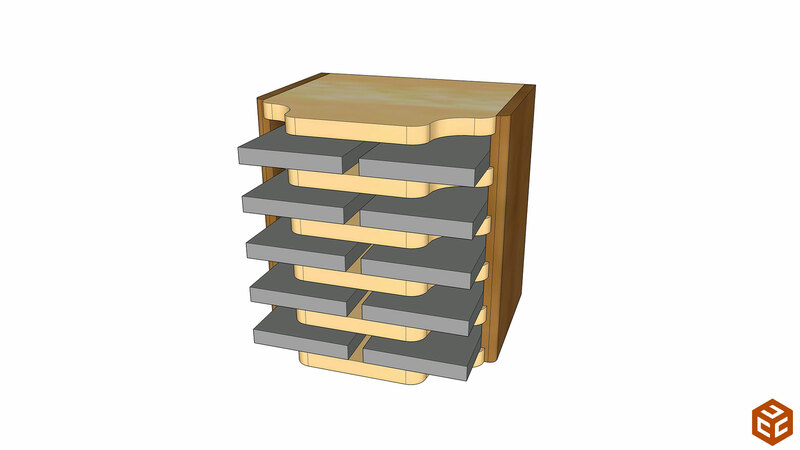 7 dados on each side board meant 14 dados in total. 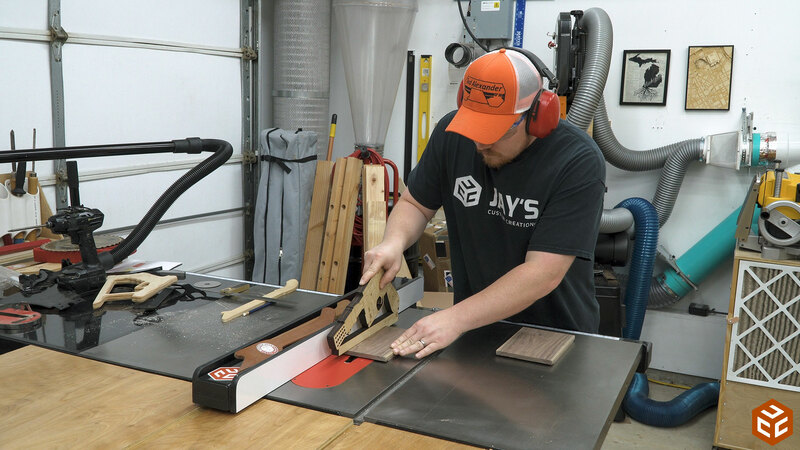 One of the benefits of using dado joinery is that once the appropriate width is dialed in on your dado stack for your material running all of the dados is really quick and as easy as moving the fence on the table saw. 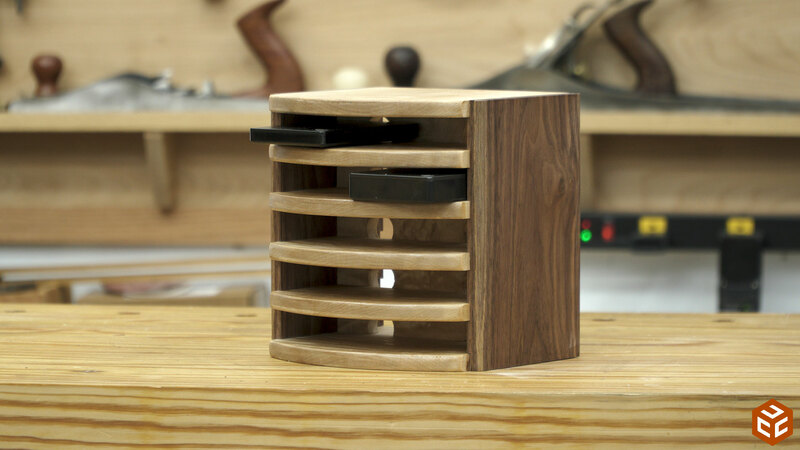 And another quick mock-up of the case after the dados and by this time It was getting late and we were both running out of steam with a lot of work left to do. So we decided on a design change to simplify the front. Instead of multiple curves we thought a single curve on the front would have the same functionality of exposing one of the drive corners while still breaking up the rigid, rectangle look. 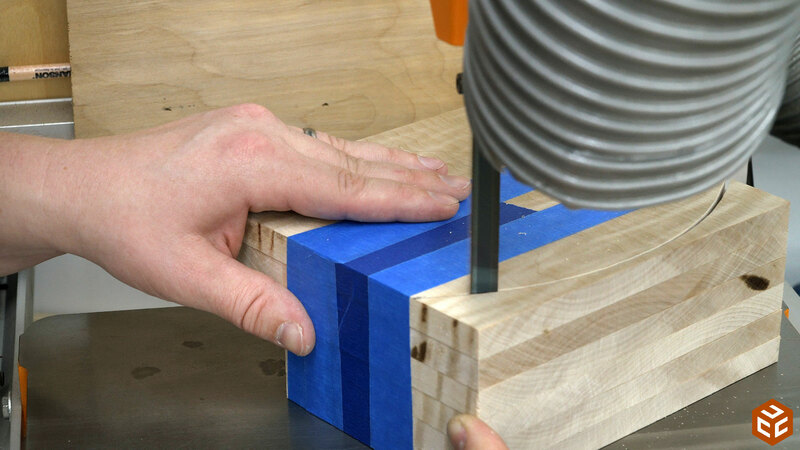 After determining and drawing an appropriate radius on the front of the top board I taped together all of the pieces and followed the line at the bandsaw to cut them all out at the same time. 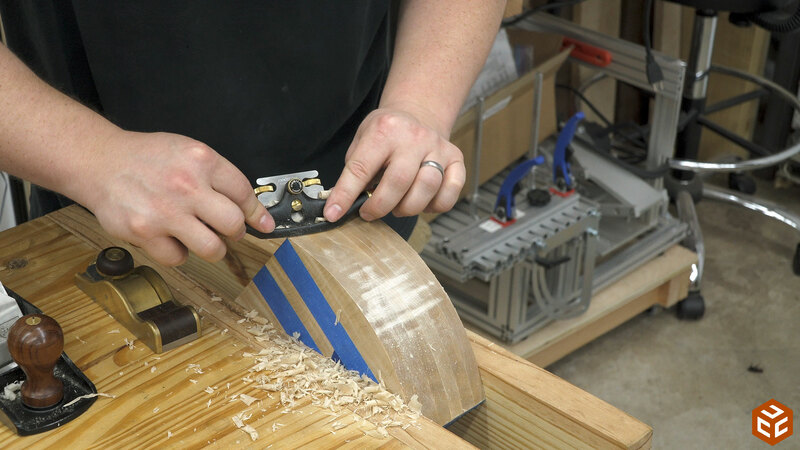 And then used a spoke shave to clean all of the cut faces. If you’ve never used a spokeshave before I really suggest getting a hold of one. 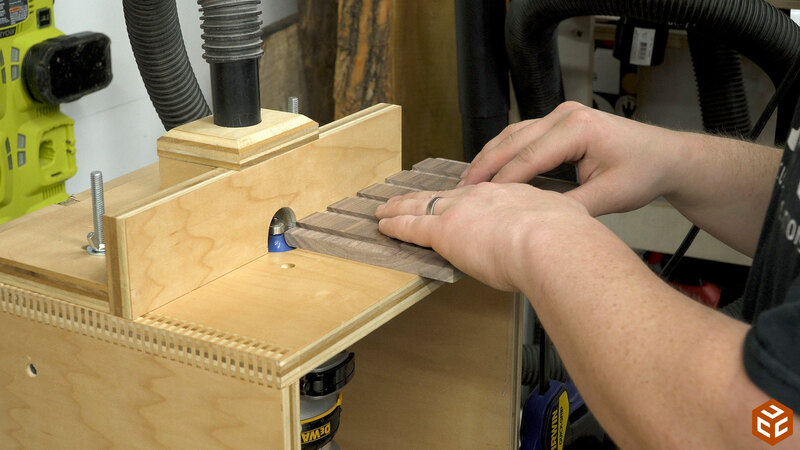 Not only are they a lot of fun to use they are really handy in situations like this where using sandpaper alone on the end grain would take forever. 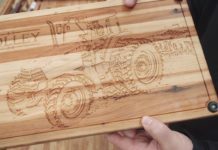 Jeremy is a bit of a perfectionist and does automotive body work for a living so he wanted to take it a step further with the sanding. 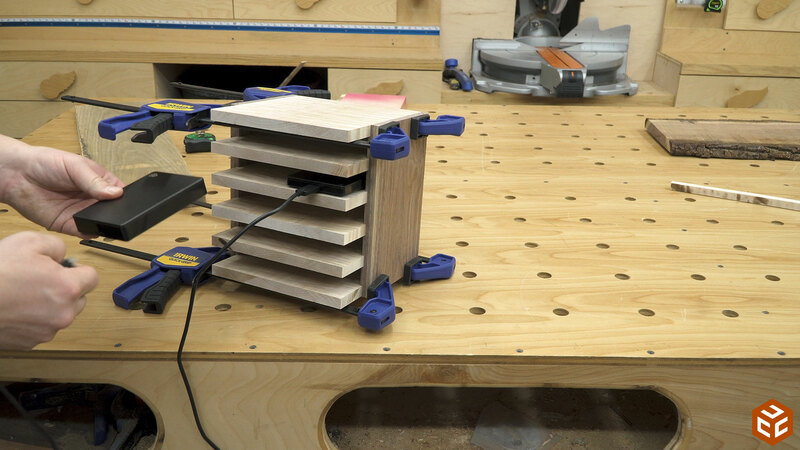 And he sanded…and sanded….and sanded….and sanded… Legend has it that he’s still there with 220 grit paper sanding the endgrain. To allow the wires to pass through the back side we drilled 1” diameter holes a little below center of each of the drive bays. Having them a little below center allows the cord to be pushed through the back while sliding on the shelf which makes it a little easier. 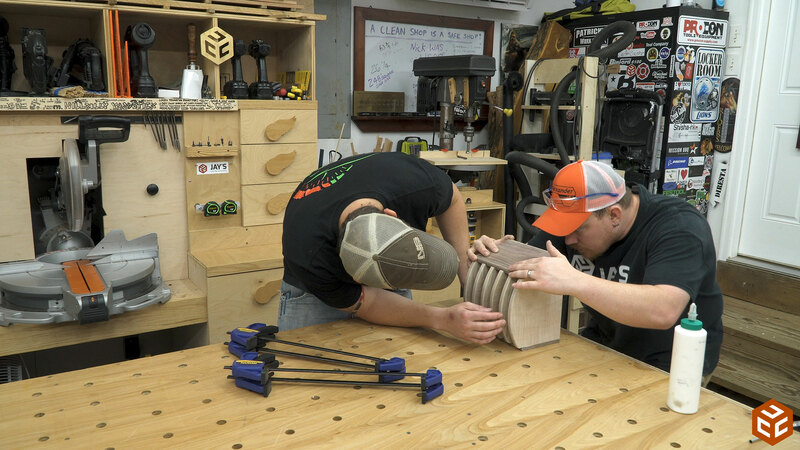 Before assembly we added a slight roundover to the front edges of all of the parts at the router table. Then glued everything together. 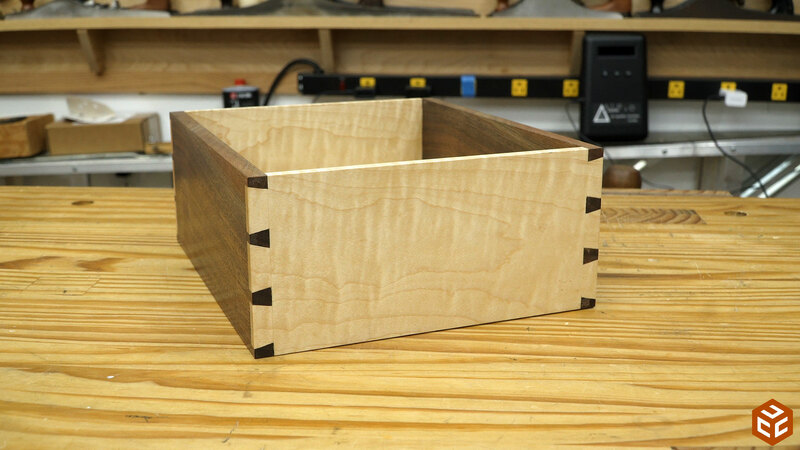 It’s been quite a while since I made a project utilizing dados and rabbets as the main joinery and it’s just so refreshing when you go to assemble something and everything just clicks together. Other than the fact that you still have to use clamps it reminds me of building with LEGOS. 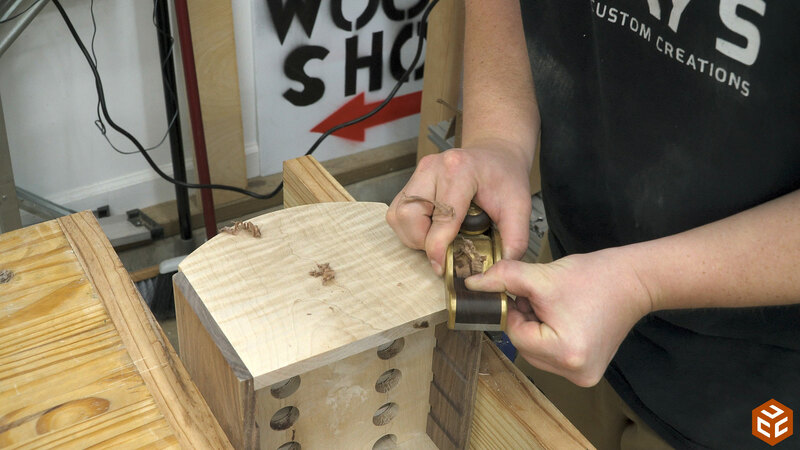 Once the glue had dried I did a final surface prep including flushing up all of the exposed joints with a block plane. 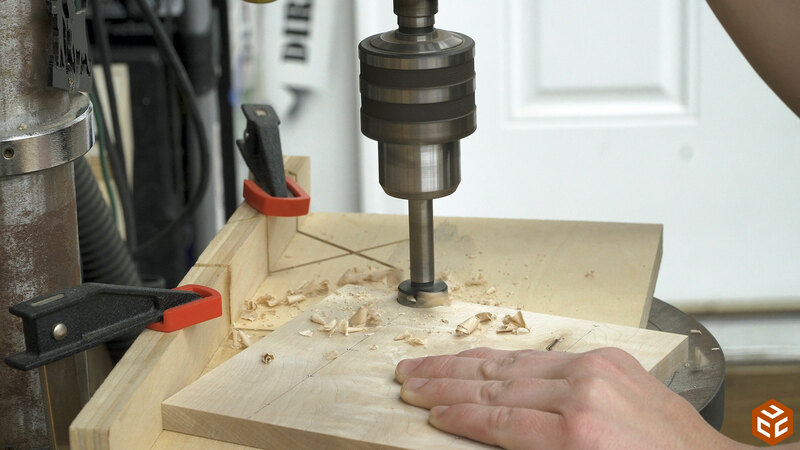 Speaking of block planes…the one I’m using here is an infill block plane I bought from Tony Rouleau. It handles end grain like a boss. 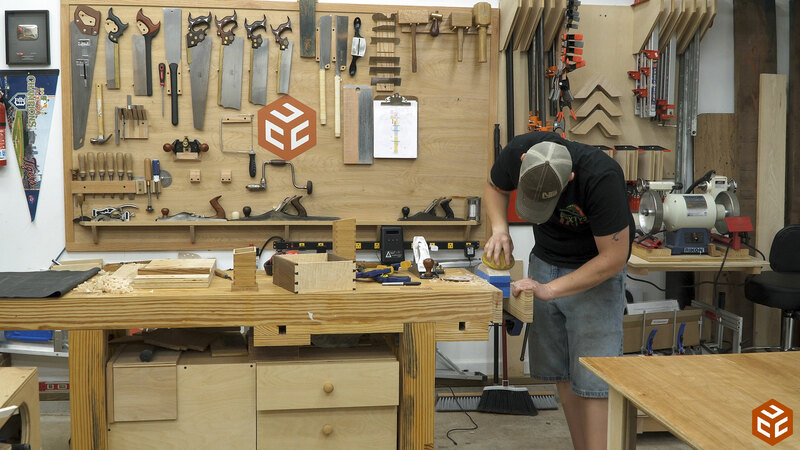 An incredible tool and an incredible craftsman. And then finally we finished it off with a couple of coats of shellac. I wish I could add the heart eyes emoji here. 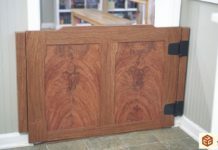 Curly maple and walnut is an incredible combination. 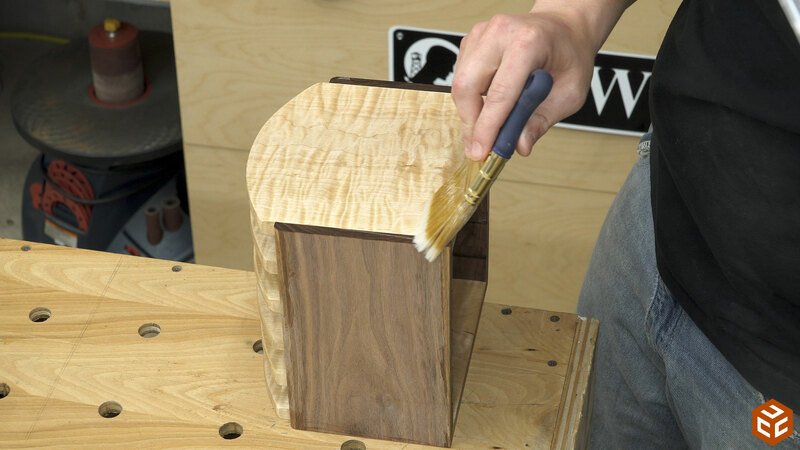 Applying the finish is a very gratifying step in the build process and it’s only magnified when you are able to use truly beautiful wood. No handle necessary. He wanted something to sit on his desk to store all of the drives. He only takes one drive and his laptop when he travels. Nice clean job. It looks good. My one concern is that, fitted as tightly to the drives as this is, it’s going to risk trapping heat and making the drives fail a bit sooner than they should. You may get away with it; you may not. There is plenty of room for airflow. Jay, nice little project~! 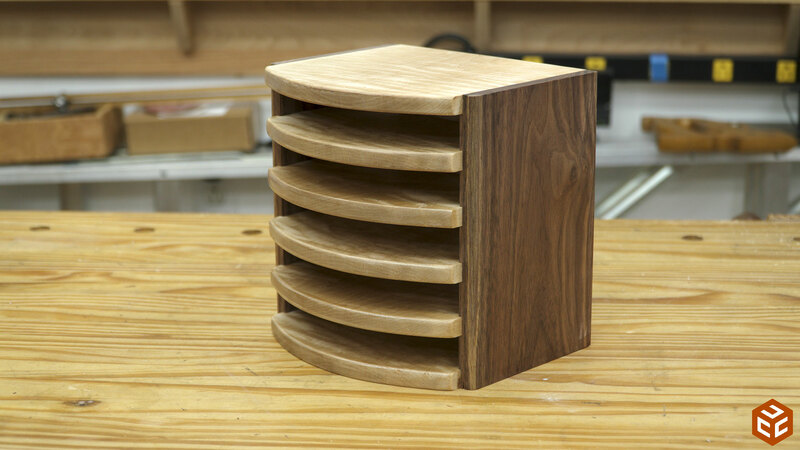 Curly maple & walnut absolutely make a beautiful combination. 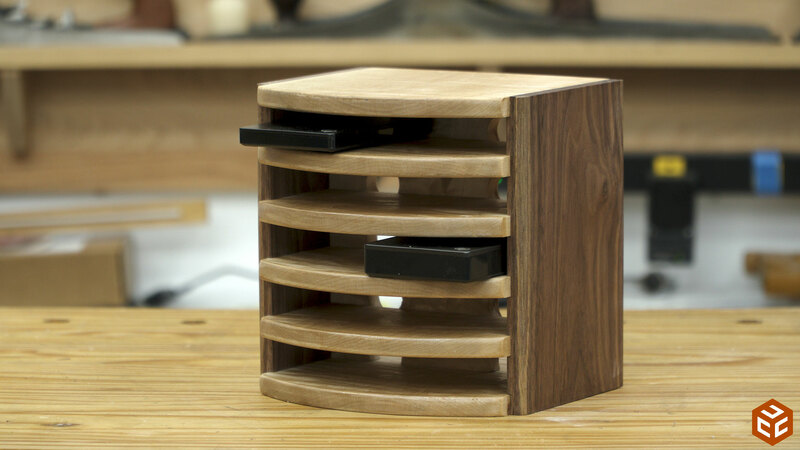 I too use several small external drives, so this just popped up toward the top of my “to build” list.